Right, what are you lot still doing here? It is 22:30 GMT and there is only one place to be and that is watching Match of the Day, with Match of the Day Social to accompany you. And Southampton can breathe a little easier. Based on their performance today, they will be a lot higher in the hit parade come May. This is what the north end of the Premier League looks like. Leicester still safe and sound in top slot despite defeat today. Southampton skipper Jose Fonte talking to BT Sport: "It was imperative that we had a reaction and today we showed passion and togetherness to change the bad run we were on. I'm very happy with our performance and the result. "The plan before the game was to be ourselves - a hard-working team, quality up front and defending well as a team. We showed today we are still a very good team and from now it gives us good confidence to go on a good run." "We did not play well enough"
Arsenal manager Arsene Wenger talking to BT Sport: "We lost too many challenges today, they were sharper than us. I think we were unlucky as well, their first shot on goal went into the top corner from the right back, the second goal came after a foul on Koscielny. Southampton manager Ronald Koeman talking to BT Sport: "It was a fantastic performance against a good Arsenal team - that's a big compliment to the players..We caused them lots of problems up front through Mane and Long. Perfect performance today. "Normally I keep criticism of my players inside but sometimes people need to know what the manager is thinking. We showed fantastic belief in everybody and showed how good we are today if we play at our level. "The second half was far better than the first, some good goals and maybe more chances to score more." It is a bumper Match of the Day this evening, with all 20 Premier League teams in action. 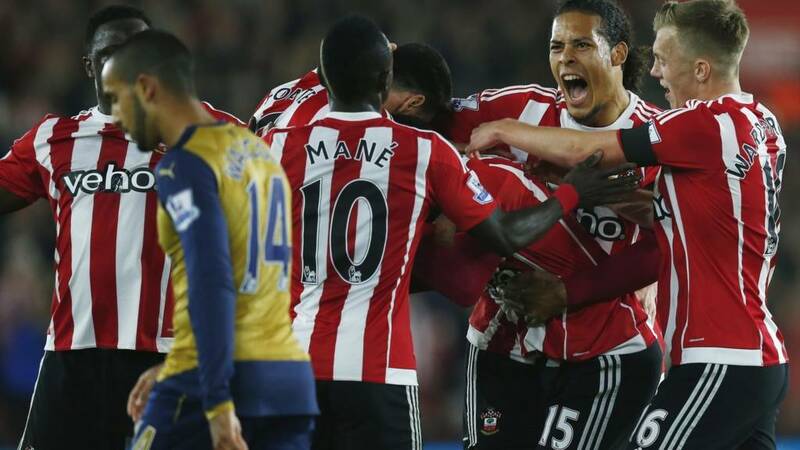 Watch from 22:30 on BBC One, with Southampton v Arsenal first up. You may want to put the kettle on Gunners' fans. Ronald Koeman has just popped up in front of the television cameras, all wry smiles and barely contained glee. Arsene Wenger is next in the queue. He is not sparing his side too much, telling them that they were second best in too many challenges. Full quotes to come very shortly. The team that wins the league this season will drop a lot of points. Normally there will be a team that won't allow you to do that. This year every one is fallible and everyone looks to have weaknesses which don't look likely to change. Nobody look the finish article so I think it will be topsy, turvy until the end end. Jose Fonte (number six) and Juanmi (No 20) combined before Dusan Tadic set Shane Long free to score his second of the match. "They did not like the pace in behind"
Southampton striker Shane Long speaking to BT Sport: "We knew we were a good enough team, but it was not happening in the last few weeks. We went out there with the idea of fighting hard for each other firstly and hoping the play comes from there. They did not like the pace in behind from me and Sadio and we played on that. "It was a good day all round, but we have got a hard game coming up in two days' time against West Ham." On opening goalscorer Cuco Martina: "He's been brilliant in training, worked really hard and deserved his chance in the team. He deserved the goal and that performance today." With the spread of the money in the league, it's allowing the lesser sides, so to speak, to compete. There's been a definite levelling out. This does not flatter Southampton, they were fantastic. They had a game-plan and stuck to it. The first goal was massively important. They got it got it and then exploited Arsenal's weaknesses. On the flip side, Arsenal were awful. Arsenal have had the look of champions in the past few weeks. Today they looked like mid-table fodder at best, short of cutting edge and, more worryingly, fighting spirit. Perhaps today was the day when the injuries to the likes of Alexis Sanchez, Santi Cazorla and Francis Coquelin caught up with them. Arsenal have looked vulnerable to that ball in behind all night. They have got away with four. Arsenal's defence is shredded by Shane Long's pace once more and this time the finish sticks. Juanmi lays the ball into oceans of space behind an Arsenal defence playing far too high and Long advances to squeeze the ball between Petr Cech's legs for a humiliating fourth. I don't think we can under-estimate what that first goal from Martina did. If Arsenal had scored first we would have had to see a different performance from Southampton. As it is, it's worked perfectly for them. Per Mertesacker looked like he was treading in treacle as he chased after Shane Long in that latest Southampton chance. Arsenal's defence has been better of late, but that is a weak link. One that Barcelona might make even more of in the Champions League last 16. Shane Long scampers in, slides the side-foot finish past Petr Cech, but only against the base of the post. Southampton denied a scoreline-plumping fourth. "One Ronald Koeman" chant the Southampton fans. This has definitely been the sunny side of his Jekyll and Hyde team. Arsenal's fans are heading for the train station. The exodus has begun. They will hope for better at home to Bournemouth on Monday. Sadio Mane received a standing ovation as he was substituted and this graphic of his successful passes during the match illustrates why the Saints playmaker received such warm applause. Southampton are applying a salt massage to those Arsenal wounds. There are four of them haring upfield in a swift counter and Shane Long cannot quite get over the top of Dusan Tadic's deep cross - the ball looping up off his head from Petr Cech to claim. The best player on the pitch heads off it. Sadio Mane makes way for Juanmi and gets the standing ovation he deserves. A low cross into the Southampton box. Olivier Giroud gets a touch, as does goalkeeper Maarten Stekelenburg and the ball runs agonisingly across the face of the goal and away to safety for the Saints. Arsene Wenger rolls the dice again. Off comes Theo Walcott, on comes Alex Iwobi. The 19-year-old is Jay Jay Okocha's nephew. Arsenal need some of his uncle's magic now. Mesut Ozil stands over a free-kick in a decent spot. The big lads are up. Fifteen minutes to go. The Arsenal need something from this if they are to pull a point out of the hat. Nope. Southampton clear with comfort to spare. If you had £30m and could get hold of Wanyama you'd buy him tomorrow. He's a fantastic player. A bit of midfield biff as Victor Wanyama snaps in on Aaron Ramsey, the Welshman reacts angrily and the pair lock antlers for a bit. Referee Jon Moss pushes them apart and tells them to simmer down. It was a corner. Just a corner. Simple but effective from the Saints. It did not look like there was a lot of fight in the belly of this Arsenal team at two down. At three, it is chin on chest time for the Gunners. This will be a procession for the Saints in the final 20 minutes, barring something extraordinary. It's a great run at the near post and a super ball in but he's the one that wants it. Fonte showed the greatest determination. It's a bonkers league. Arsenal have been so average tonight and it could have been worse. That is the Gunners as stuffed as the festive bird. It is a routine third as Jose Fonte meets a corner with a bullet header at the near post. Petr Cech started to come off his line and decided against it. Maybe that spread some uncertainty among his defenders, but no-one came out of that looking good for the Gunners. Yep, that is Jordy Classie's race run. The Dutchman goes for a sit-down and a sip of isotonic as Oriol Romeu takes on the role of midfield pitbull. Jordy Clasie has gone down with a touch of cramp. Would the lactic be biting so hard if his side were chasing 2-0 rather than defending it? Perhaps not. Or perhaps it would. Oriol Romeu, formerly of Chelsea, is readying himself on the bench. At this stage, 2-0 is massive. Arsenal don't look like getting one goal, never mind two. Unless there's a massive sea-change in this game, Southampton will win. The personnel clearly haven't functioned as they did against Manchester City. It hasn't suited them whatsoever. Alex Oxlade-Chamberlain is being given a lecture on the sidelines in preparation for his arrival off the bench. Finally he is fully briefed and the former Southampton man takes the place of Joel Campbell on Arsenal's right. Southampton's second goal came against the run of play as Arsenal have been monopolising possession. An hour gone. Arsenal with a deep hole to dig themselves out of. There are not a lot of options on the bench to help them either. Alex Iwobi? Jeff Reine Adelaide? Maybe less so. Arsene Wenger is doing his best impression of an angry eagle. You don't need to be a lip-reading expert to interpret the Arsenal manager telling the fourth official that the referee has made an "unbelievable" decision in letting that goal stand. Look at Long and look at Koscielny. Does Long foul Koscielny? It's a foul. Long just trips Koscielny. It's a simple finish but if Koscielny stands up he tracks Long's run. But it's a bit of poetic justice. It's just evened itself up there. Shane Long touches the ball into the path of Sadio Mane and motors into the box to meet his team-mates beautifully weighted return with a simple side-foot finish from 10 yards. There was more space than there should have been in the box, because Laurent Koscielny tumbled as he tried to keep pace with Long. Arsenal are not happy. Jon Moss says the goal stands though and that is what matters. The ball comes straight from a free-kick to van Dijk. I don't know how you can give that. You couldn't see van Dijk. You are talking small margins but I don't see how you can give that. I think that's a legitimate goal. Petr Cech got clattered by former Celtic man Van Dijk as the pair contested that cross. While the Czech goalkeeper is down getting treatment, there is time to get stuck into the replays. Even after a few viewings it was difficult to say whether the linesman made the right call. Van Dijk looked like he was just onside, but there were a host of Southampton players who were the wrong side of the last man when the ball was played in. Virgil van Dijk up above Petr Cech, who has gone on a very ambitious rush off his line. It's into the net, but the flag is up. Arsenal have lacked any fluency and any craft and Southampton have looked pretty comfortable. They have played the better game. Sadio Mane is still giving the Arsenal defence the slip. The Southampton man, full of power and pace, muscles his way towards the byeline and teases a low cross into the corridor of uncertainty. Steven Davis is closest to getting on the end of it, but is just squeezed out by the combined attentions of Per Mertesacker and Hector Bellerin. Look away now Arsenal fans. There is an eyesore of a statistic coming your way courtesy of the number-crunchers at Opta. They report that Arsenal haven't won after trailing at half-time in the Premier League since October 2011 when they beat Chelsea 5-3. Since then, they have been losing at half-time in 28 Premier League games, losing 17 and drawing 11. Aaron Ramsey has his passing boots on today. He's made the highest number of passes in the Arsenal side - 48. All the television cameras are trained on Cuco Martina as the Southampton full-back - whose wonder strike separates the two sides - heads down the tunnel. Here is a new entry in your football atlas as well. The 26-year-old, who was born in Rotterdam, represents Curacao one of the former Dutch Antilles. "Southampton have been set up well, they knew what to expect, and Arsenal have a couple of players not totally au fait with their system. He will have to change it - it will be interesting to see what Wenger will do. Southampton are set and defending very well." Sadio Mane wins a free-kick and kills some time as he teases Aaron Ramsey into a foul with a stepover in the centre circle. One added minute at the end of the half. Sadio Mane dinks a throughball over Per Mertesacker, who turns like a tanker as Shane Long nips in behind him and in on goal. The Irishman never quite has the ball under his control though and on the stretch his attempt to lift over the advancing Petr Cech is well over the top. Arsenal dominating the ball as we tick down towards the break. Southampton's fans are urging their side to concentrate and hold out. Theo Walcott with a free header - plenty of power, lacking a bit of direction. His effort brushes the outside of the side netting on its way behind. For all their trademark pretty stuff, the aerial route looks Arsenal's likeliest way back into this one so far. "With the two banks of four, Arsenal really are struggling to break them down. Southampton are looking very comfortable at the moment." Theo Walcott feathers the accelerator and glides in off the right flank, leaving a clutch of Southampton defenders choking on fumes. His shot from 15 yards is not a clean hit though and trundles into the arms of Maarten Stekelenburg. Big call from Jonathan Moss. The referee rules that Shane Long - a featherweight compared to Per Mertesacker - has fouled Arsenal's centre-back in a tussle moments before applying a cute-as-a-button finish past Petr Cech. That looked fair enough to me, but Long picks up a yellow, part for the foul, part of the advice he aimed Moss's way. There is a little niggle out there. Arsenal playmaker Mesut Ozil is having a running row with Jordy Clasie in the Southampton midfield. Theo Walcott has also taken exception to his treatment at the hands and studs of Victor Wanyama. What have you got Gunners? Time to show some grit and guts. "With that wind swirling neither Mertesacker or Koscielny look comfortable." A few jitters are starting to creep in at the back for Arsenal. Laurent Koscielny mis-controls a long hoof forward into the path of Shane Long and his second touch is a successful tackle. That could have easily been a lot worse for the visitors. Here are all of Cuco Martina's touches so far. Can you spot the one for the goal? Shane Long is back into the fray after getting a small cut on his head and undergoing a spot of sideline treatment. James Ward-Prowse takes a touch on the edge of the box, wraps his right foot around the ball but sends it soaring well north of the bar. Southampton are a yard quicker and a few IQ cleverer after that opening goal. This is a real test of Arsenal's title chops. Southampton are buzzing on the back of that super-strike from Cuco Martina. We have just seen another replay of his outside-of-the-foot screamer - it swerved like a toe-poked beach ball. It's flown in. Cuco caught it as sweet as a satsuma. "From where we are there is no way that can go in, speculative at best. It bends, curls and stays at the same height. To beat Cech from that sort of distance, with the outside of the foot, that is magnificent. What wonderful technique, what a wonderful strike!" This is Cuco Martina's first Premier League start. It is his first league appearance since September. He won't have to wait much longer for his next judging by that. Simon Davis header drops to the full-back 30 yards out and he hits an absolute pearler, off the outside of his left peg, right into the bottom corner past a helpless Petr Cech. Goal of the season longlist at the very least. Arsenal go as Route One as Arsenal ever do - Mesut Ozil clipping a little pitching wedge of a cross in towards Olivier Giroud. The Frenchman doesn't make a clean connection but the ball drops loose to Nacho Monreal in the box. Ten yards out and he duffs it straight at the goalkeeper. Spotters badge in the post to you Mr Ramsey. The Arsenal midfielder, 25 today, knocks a superb cross-field pass blind into the path of the on-bombing Nacho Monreal. Monreal's low cross takes a nasty deflection and threatens to loop up over Maarten Stekelenburg before settling on the roof of the net. Everything threatening from Southampton is coming though Sadio Mane. His is a bigger box of tricks than Paul Daniels. It takes three defenders to snuff out the danger posed by the Senegalese around the box. Sadio Mane climbs aboard the showboat with a extravagant backheel pass towards James Ward-Prowse. It is cut out by the Arsenal midfield though so he will have to hope his artistic marks make up for a lack of technical execution. "This year you get the feeling with the way that the league is wide open, and how people are dropping points, that Arsenal have a great chance to go on and win it." Shane Long is living on the wrong side of the linesman's law and is caught offside for the third time in less than 10 minutes. Modelling his game on Pippo Inzaghi clearly. Southampton are pressing quite high on Arsenal and the Gunners have to resort to knocking it long as Mathieu Flamini gets a little flustered in possession. A good position for a free-kick as Olivier Giroud is clobbered from behind, but Mesut Ozil's lofted ball into the box is too far in front of Per Mertesacker who has rolled up from the back. "That was a great chance, Fonte fell to the ground but that was a terrible header - there was no pressure on him at all." Olivier Giroud wins an early corner for Arsenal and has a decent chance to convert it into an early lead for his side, but the France international plants his header over the top as he rises unchallenged to meet the delivery from the left. A handshake between Arsene Wenger and Ronald Koeman on the sidelines, a huddle of Saints on the pitch and we are under way. "I've been impressed with Arsenal, especially as they have six or seven players unavailable. They played Man City fantastically, tactically they played the system Arsene asked of them very well." You can tune in to 5 live commentary via the play icon at the top of this page. Jose Fonte munches down a pre-match flapjack as he waits for the Arsenal team to join his own in the St Mary's Stadium tunnel. Both teams sporting trackie tops as they stride out onto the playing surface. Arsenal might fancy their chances of winning the Premier League title - but they are way off the pace in our Predictor league table. Gunners fans are eighth in our standings, with Southampton supporters down in 14th place. You can help improve your team's form by having your say in our Predictor game. This fella has been whipping up the St Mary's Stadium crowd. Sammy Saint is an energetic presence, with some smart dancefloor paws. But would he win a dance-off with the Gunnersaurus? It would be a contest I'd pay to see. "On Christmas Day in 2014, Southampton were fifth in the table, two points better off than Arsenal in sixth. A year on and Arsenal are 15 points ahead of the Saints as they head to St Mary's Stadium, where they last won back in 2003. "Arsenal's win over Manchester City was a huge psychological boost, and makes them the bookies favourites to haul in Leicester and win the title. "Southampton manager Ronald Koeman has described the next fortnight as crucial. They've scored only twice in their last five league games and taken only one point. It's left Koeman glancing nervously over his shoulder at the scrap below." "There's no doubt that Petr Cech is making a difference to Arsenal this season. At just 14 goals conceded they've got best defence in the Premier League. What a springboard that is to be able to attack from. "Arsenal are a team in form, and if you look at their squad I really think they should go on to win the league this year. Whether they will is in doubt because they haven't done it for so long." Southampton make four changes from the team that lost 2-0 to Tottenham last time out with Graziano Pelle and Cedric Soares out injured and Cuco Martina coming in for a first start. Arsenal meanwhile are unchanged from the side that beat Manchester City 2-1 on Monday as Olivier Giroud continues up front and Mathieu Flamini and Aaron Ramsey are paired in the centre of midfield. Roll up, roll up. All aboard Monsieur Wenger's roller-coaster, where the next stop might be top of the league. After Leicester's defeat at Anfield today, the Gunners will go top of the pile with victory over Southampton this evening. They would be one point clear of the Foxes, four ahead of Manchester City, seven clear of Tottenham, 10 in front of Manchester United. Their best chance yet of winning the league since their last triumph in 2003-04? Welcome to our live page for Southampton v Arsenal. We’ll have text commentary here from 19:15 GMT. You can keep up to date with the rest of today's games here.